A customer in Belrose was having issues of visible mould particularly in cupboards and around the floor skirting boards, along with musty smells throughout the house. She had tried using many products and home remedies before calling us and was concerned about the health risks of mould around the home. We did a thorough investigation and determined the mould was being allowed to grow due to a moisture issue under the floor of the house caused by water in the ground being drawn up into the space under the floor and being unable to escape, the vents in the exterior walls of the house were not enough to let the moist air escape and the moisture was trapped. We created a map of the underfloor structure and using it determined 4 pick up points for extractor fans to be installed that when activated would ensure that dry fresh air passed through all areas of the under floor cavity. 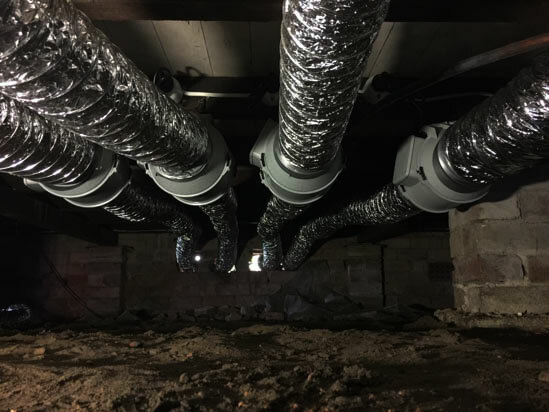 Although the highest quality low noise fans were used they were mildly audible from the upstairs area so a location was chosen away from the main living areas to install the motor units to minimise the affect the noise would have. The customer opted for colour matched moulded vents to be installed and for the bad air to be vented into the outdoor garage area. A control circuit was installed to operate the fans at 30 minute intervals 3 times a day, this gives the fans a chance to completely re fresh the air in the underfloor cavity 3 times a day, these times are in daylight hours to ensure the air drawn in to the cavity is warm and dry and also matched to the customers preferences to minimise effects of noise created. An override switch was also installed to allow continuous operation in the event of heavy rain or the desire to operate the system for longer periods. After 4 weeks of operation the customer reported the bad smells had disappeared and mould had not returned after being treated.